The Spanish explorer Juan Manuel de Ayala sailed to the Bay of San Francisco in 1775 and gave Spanish names to the sandstone islands he found there. Originally (“because of the abundance of birds on this island”) with Isla de Alcatraces he called the island Yerba Buena Island. The name was not transferred to today’s Alcatraz until 1826 by the British naval captain and geographer Frederick William Beechey in the form of Alcatrazes Island. 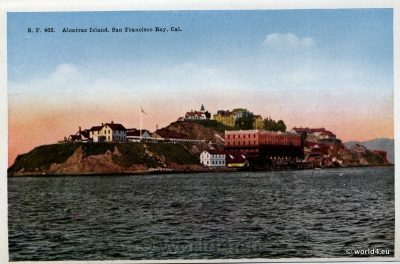 The island received its final name Alcatraz Island in 1851 by the American coastguard after California became a US state in 1850 after the Mexican-American war. Alcatraz is an 8.5 hectare, approximately 500 meters long and up to 41 meters high US-American island in the bay of San Francisco, California. On the island, the first lighthouse on the west coast of the USA was put into operation in 1854. In the second half of the 19th century it was used as a fortified fort. As early as 1861, a prison was integrated into it, initially for Northern prisoners of war during the Secondary War. In the early 1930s, the fort was converted into a prison island and from 1934 to 1963 was one of the most famous and notorious high-security prisons in the United States. Due to high operating costs, the prison was abandoned in 1963. In 1964 and from the end of 1969 to mid-1971, the island of Alcatraz, which has been regarded as uninhabited since the closure of the prison for the authorities, received renewed public attention due to politically motivated occupations by the Indian movement. In the meantime, the island has become a museum tourist attraction. Alcatraz is part of the Golden Gate National Recreation Area under the supervision of the US National Park Service. Previous PostGolden Gate at Moonlight. Postcard 1910s. Next PostHummel, Collectible German Postcard 1920.